These long stem funnels have smooth walls, 60° cone angle and external ribs to prevent air lock. 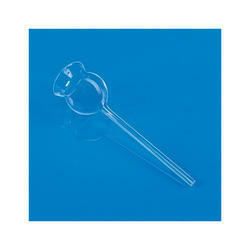 Moulded in polypropylene, these clear funnels can also be steam autoclaved. Our Analytical Funnel are available to our clients at highly competitive prices. It is made using most sophisticated technology and high grade raw material that is sourced from most trusted and valued vendors. We also make sure that these are made in accordance to the prevailing industrial norms. These Long Stem Funnels have smooth walls, 60 cone angle and external ribs to prevent air lock. Moulded in polypropylene, these clear funnels can also be steam autoclaved. 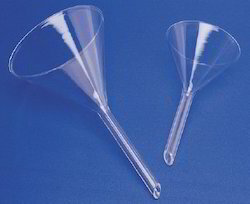 Cone Funnel is a conical fabricated stainless steel component having a small whole or narrow tube at the apex and used to channel the flow of a substance like liquid or powder in, as into a small-mouthed, container commonly used pharmaceutical industries or packaging industries filling machines. This is a customize job of SS fabrication made from a Stainless Steel sheet and pipe. These long stem funnels have smooth walls, 600 cone angle and external ribs to prevent air lock. Moulded in Polypropylene, these clear funnels can also be steam autoclaved. - Designed specifically for analytical chemistry. - The body of the funnels is 60°. - These funnels are provided with internal & external ribs to prevent air blockage.